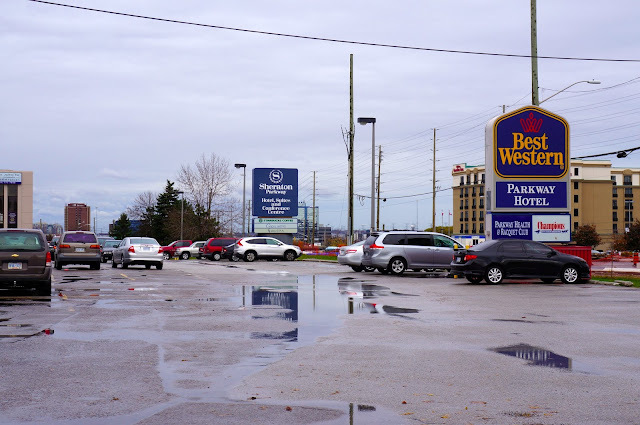 In November last year my wife and I spent four weeks in Toronto - a trip that was motivated by three things: the 2012 World Fantasy Convention; the Merril Collection of Science Fiction, Fantasy and Speculation, where I undertook a three-week professional placement (see my next post); and, finally, our need for a holiday. 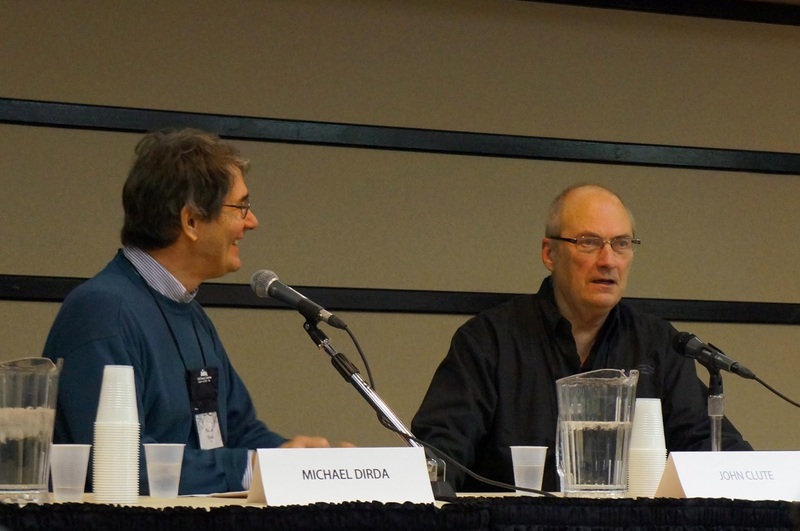 The theme of the 2012 World Fantasy Convention was urban fantasy and there were many panels on this issue, mostly grappling with trying to define exactly what urban fantasy is (and usually with limited levels of success). There were a few panels I found particularly interesting, including one titled 'Faith and Fantasy' (fascinating discussions, well chaired by Jonathan Oliver), one on book collecting, one examining Clute's The Darkening Garden: A Short Lexicon of Horror (afterwards I managed to pick up what may have been the last copy of this limited edition book available for sale), and the 2012 retrospective "Speaking of the Year's Best...". I was particularly glad to meet John Clute again, whom I had met (and discussed Gene Wolfe with) in 2010, when he was in Melbourne for AussieCon 4 (the 2012 World Science Fiction Convention) and the Changing the Climate conference on utopia, dystopia and catastrophe. 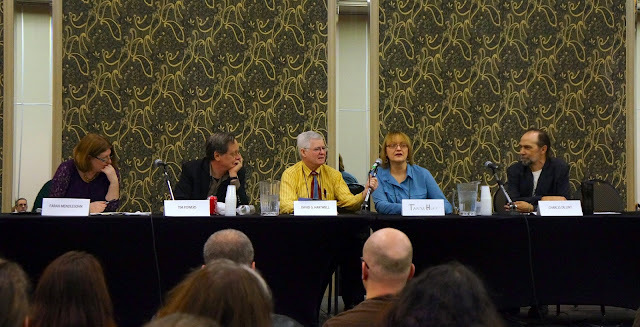 I also got the chance to chat with Tim Powers, Bill Willingham, Isobelle Carmody, Charles de Lint, Jo Walton, and a few other authors I've enjoyed reading the past few years. Another highlight was attending a reading by the Australian author Jack Dann, who read "The Island of Time," a story he wrote for the upcoming Gene Wolfe tribute anthology - it was a fantastic story, written in the second person and very thematically related to Wolfe's brilliant story "The Island of Doctor Death". Something my wife and I weren't expecting: when registering at the start of the conference we were each given a 'book bag' containing 20 books. As most of them were different (and looked quite interesting), by the end of the conference (and after buying a few more books from the dealer's room) we had accumulated some 40 new books. We ended up sending four small boxes of books back to Melbourne and cramming the rest of them into our two (fairly small) suitcases. Still, we had to buy a third suitcase in New York to make it to Paris and home with all our extra luggage (read: books). The conference venue was nice, but relatively isolated and inconveniently located over an hour out of downtown Toronto by public transport. Overall, though, it was a pretty fantastic week of immersion in fantasy literature and conversations with authors, scholars and fans. I am currently working at a university library, while studying the Master of Information Studies (Librarianship). My interests include science fiction and fantasy (literature, film and TV), graphic novels, gaming, being freakishly organised, and all other things nerdish.